McConnan Bion O'Conner Peterson law. 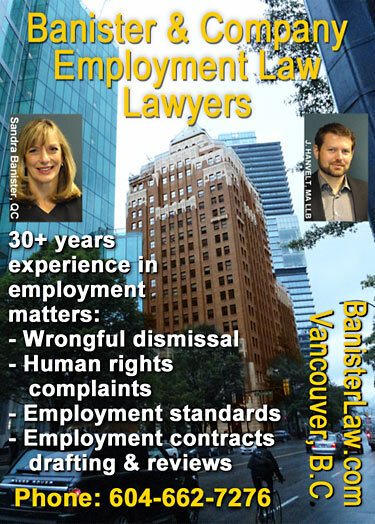 corp.
has over 30 years experience with Employment Law, Human Rights Complaints, work with Labour Unions, Wrongful dismissal contracts, WCB reviews and Personal injury ICBC claims disputes. On graduating from the University of Victoria's faculty of law in 2007 - he clerked at the British Columbia Supreme Court and completed his articles with a large downtown law firm. Jonathan has taught at the Canadian Labour Congress' Winter School and currently sits on the Employment Standards Coalition, BCemploymentstandardscoalition.com an organization that is seeking legislative reform to better working conditions in the province. Frank brings over 40 years of business commercial law and employment contract law experience to his clients. Prior to moving to Victoria, Sarah practised workplace law at a national law firm in downtown Toronto. She assists and represents both employers and employees in respect of a wide variety of workplace law matters, including those arising from employment contracts, employment standards, termination of employment, discipline, policies and procedures, union organizing, human rights and privacy matters. Sarah is also a graduate of Osgoode's (Toronto Law School) Labour and Employment Law Program. More questions? Contact one of the lawyers above for a consultation on your situation, and see if you wish to retain them to represent you.